Richard Glover wears a skirt to work. Forget shorts: Richard Glover wore a skirt to work. It’s hot today in Sydney. And we’ve been told all week that today was going to be Fryday (those guys at the weather bureau know how to lay on a joke when they see one). Temperatures around the city are forecast to fry at 41. So morning presenter, Robbie Buck, on 702 ABC radio put the call out for men to “Wear Shorts to Work” and begin a freedom movement for male legs enslaved by long trousers on hot days. We think a GetUp petition has already snagged over 2100 signatures. Shorts to work? Immediately images of former P.M. Bob Hawke and South Australian Premier, Don Dunstan, come to mind. So too do long socks (then there are short-sleeved business shirts, but let’s not even go there). “Work” shorts? Just how does a man wear shorts to work? With great sartorial difficulty. 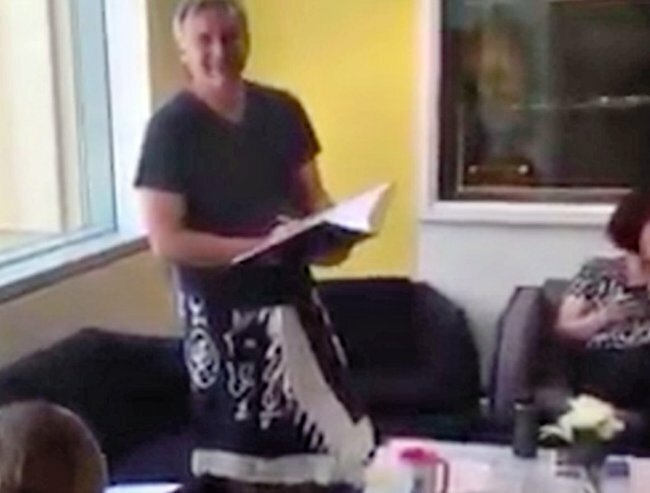 Watch the video of Richard in his sarong here. You don’t put tomato sauce on a snow egg dessert from Quay. There’s a time and a place for everything. Men’s middle-aged knees in the work place and the toes that are attached? They’re for private time, with close family and friends. Maybe even just one friend and one family member. Just remember the sauce and the snow egg. "Not a skirt," says Richard of his sarong. "It&apos;s a very manly sarong," he points out to Drive-time producers during conference. "It&apos;s got judo symbols on it, so it&apos;s a fighting sarong. You put Mel Gibson in this and he would not look out of place fighting in it." Richard, it is a skirt. But at least it&apos;s not "work" shorts.